Could this be the most perfect hand pie in Louisiana? It could! -- We're calling this the King Cake Hand Pie (because King Pie doesn't sound right) but they call it it The Krewe. If you're looking for a fun and delicious alternative to the traditional King Cake approach then this is the way to go. Frankly, this is just a great way to go . . . . . Obviously a hand pie is all about the crust and this is one of the best you can find. Crisp, flaky, buttery, flavorful, yum! The icing is just right and the filling is a wonderful mix of cream cheese and cinnamon with a light but not creamy texture. 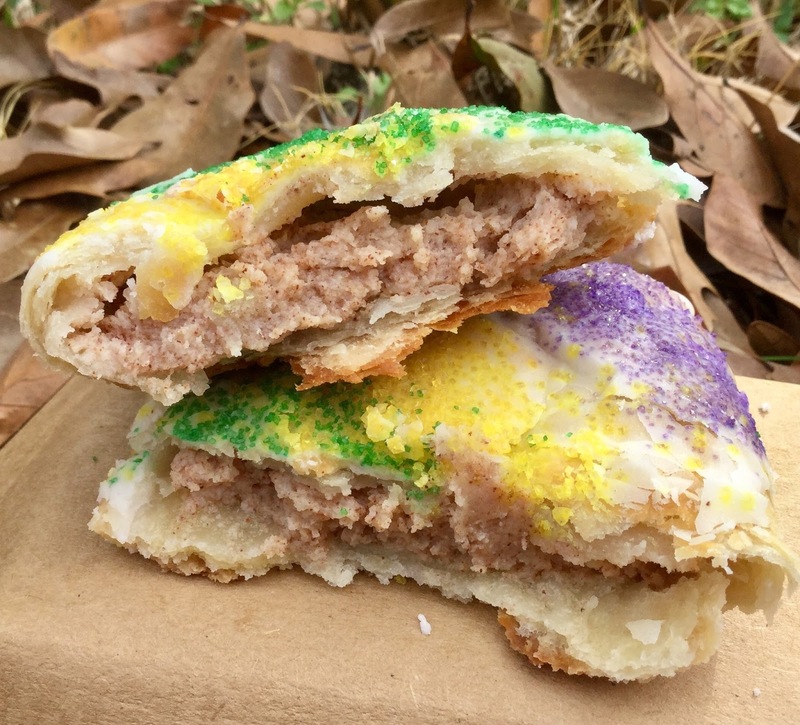 There are other King Cake alternative approaches out there like cookies and cupcakes, but this hand pie takes a lot more expert craftsmanship and the results are really delicious. Put a baby in it and call it a day. Perfect butter crust, just right frosting, wonderful cream cheese and cinnamon filling. It is truly a delight. Fresh baked bread that is light and airy is stuffed full of homemade boudin and topped with crispy cracklin before being baked to golden perfection. 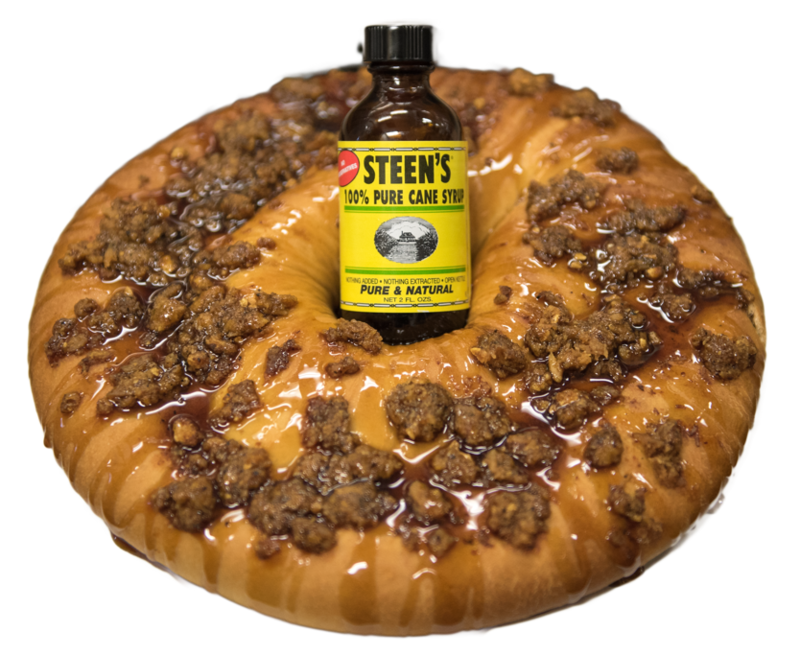 Drizzled with Louisiana's famous Steen's Pure Cane Syrup, you have yourself what has rightly been called the most Cajun of all foods. It seamlessly merges a handful of the culinary delights that Louisianans identify as part of their cultural identity. A slice of amaretto pecan filled King Cake from Champagne's Marche in Leonville. --- Wow! This is some fantastic King Cake!! 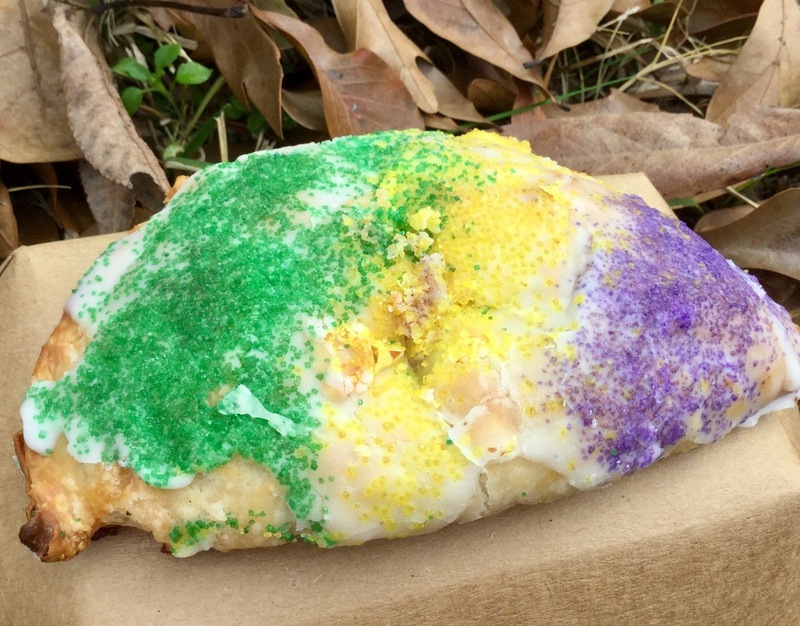 We sampled the Amaretto Pecan filled King Cake from Champagne's Marche in Leonville and were pleasantly surprised to find what we consider one of the best King Cakes around. The bread is cinnamon rollesque and it is light, fluffy, and delicious. Then, you have the filling and this baby is crammed with filling. 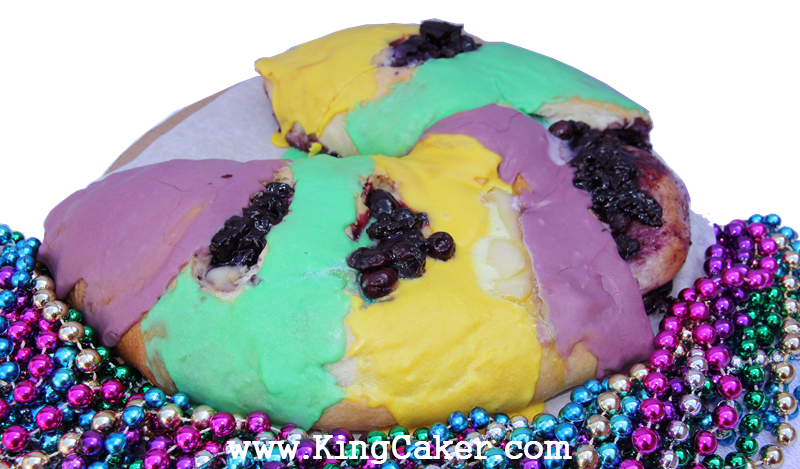 We love an overfilled King Cake and this one is litterally oozing with sweet and flavorful filling. It was absolutely mouthwatering. 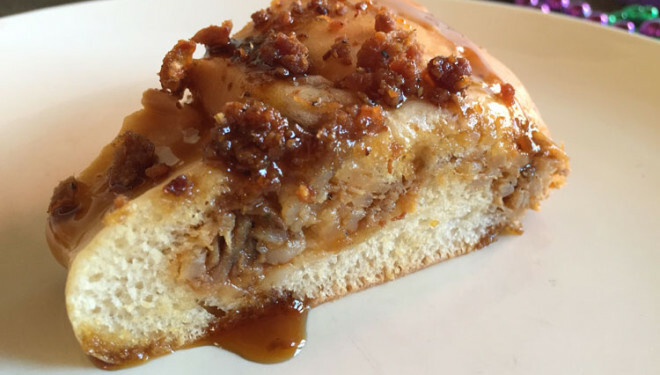 Boudin and Cracklin King Cake - The Original! A Sam's Club King Cake! --- In the past we have not much cared for the King Cakes at Sam's Club. However, we picked up a blueberry cream cheese and found it to be pretty darn good. They use the La Louisiana Bakery out of Harahan, Louisiana (near New Orleans) and it was large and, the way it is distributed between the layers of dough, you get filling in every bite! We like it that way. -- Le Petit Gateau bill's itself as a Bakery and Tea Salon and that's pretty cool. We must say that everything in the bakery case looks and smells fantastic! Lots of high quality items. The King Cake is of the ultra-traditional French Galette des Rois variety. And it is buttery, decadent, goodness of the highest order. The pastry is like a cross between puff pastry and a top end croissant. Really Good! A delicious and light puff pastry type King Cake at the Fresh Market. -- The Fresh Market, located in the River Ranch subdivision of Lafayette, sells a traditional French style King Cake with a puff pastry dough and a simple, but delicious, cream cheese filling. Their King Cake is light, airy, and moist -- very different from many of the super dense brioche dough cakes or the doughnut style cakes. -- Great Harvest is a cool place and bakes some fantastic breads and sweets. They're community minded and friendly. Grinding their own wheat and baking with whole grains produces baked goods that Lafayette is fortunate to have available. Since they're a bread company you shouldn't be surprised that their king cake is "bread centric." They offer a number of varieties including cinnamon, pecan, and white chocolate. We sampled the chocolate version and found the semi-dense bread to be filled with copious quantities of real bittersweet chocolate, lightly frosted, and heavily dusted in colored sugar. Bread and chocolate are always a good combination. A true work of the culinary arts. It'll sparkle and shine! This is definitely going to stand out as one of the most beautiful king cakes you'll come across. It literally shimmers with sparkles of luster and glitter dancing on the top of the iced cake. Sucre is an ultra posh desert shop and gelateria in New Orleans and Metarie. But it doesn't only look good, it is also scrumptious. Expertly twisted and baked fresh to a golden brown. 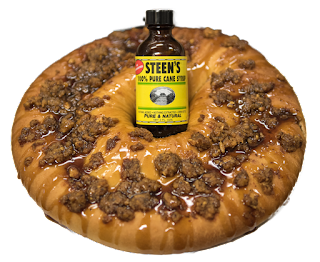 You'll love this premium king cake. -- Crystal Weddings may not "sound" like a place you'd head to for a king cake, but that shouldn't stop you from doing it! As their name belies, this family owned bakery focuses almost exclusively on making some of the best wedding cakes around. However, come Mardi Gras season they add a time-tested king cake recipe to their repertoire and each day they bake up a selection of some of Acadiana's most premiere holiday treats. Keller's Perfectly Crafted King Cake. -- The historic building that is home to Keller's Bakery in downtown Lafayette is inviting and exudes the "good old days." In fact, the King Cake recipe dates to around 120 years old! It is one of the most simply adorned cakes, but you will not be disappointed with this moist and super flavorful treat. There is nothing quite like a warm Keller's king cake. Make certain to pre-order -- or, take your chances with the throngs of folks who hang out just hoping to get their mitts on an unassigned cake. There's a lot to like here, but we especially appreciate Keller's boldness in mixing the cream cheese and the fruit filling together (see image below). A Hand-Crafted King Cake from Jennifer Hughes. WOW! If your idea of a top tier king cake is one that is hand-crafted in small batches by a skilled pastry chef; one that is a perfectly moist brioche type dough; one that is stuffed with the highest quality filling (like blueberry filling made with whole blueberries folks! ), then you must get yourself one of these "limited availability" king cakes. This is a "twelve baby" king cake for sure. -- When we're ready to get our elite-on I put on a cardigan, flip up the collar on my polo shirt, dust off my Sperry Top Siders, and head to Whole Foods to strut, prance, preen and flaunt my vapid sophistication. It is so validating! ------- Anyway, on this occasion we picked up a King Cake that they make in the store (they also sell a King Cake made off site and they have a ton of those in purple boxes but far fewer of the in-store cakes sold in a white box). It is quite good looking with piles of fluffy colored sugar and it possesses a real heft. For just $12.99 it is also one of the least expensive items in the store! (J.K.) This one only comes in one flavor: pecan praline cream cheese. -- Billing themselves as a Sophisticated to Punk Cakery (Sophi P. . . . get it?! ), this little shop has perfected the king cake cupcake! These little cakes of the king have everything you want and need in a slice of king cake and they're sure to be a hit at your next gathering. You can order them with a range of fillings and each one comes with a hearty portion of cream cheese frosting. The apple filled stood out as a crowd pleaser at our tasting event. Pick a couple dozen of these up in place of the expected king cake and you'll be the bee's knees! Apple, Blueberry, and Plain King Cup Cakes from Sophi P's Cakes. --- This Lafayette mainstay recently re-opened and is back with their classic recipes, including the one for a much sought after king cake clearly identified by the stringed frosting that adorns it. At South Side, as they have for generations, they put the cream cheese (if that's what you order) on TOP of the dough and bake it right onto the king cake. This unique approach ensures that every piece will be topped with cream cheese and that is not a bad thing at all.